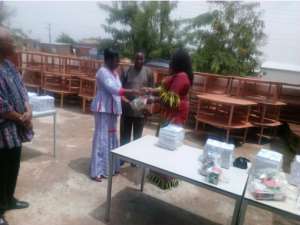 The Centre for Sustainable Rural Development (CESRUD), a non-profit humanitarian organization has donated furniture and educational materials to some selected basic schools in the Bolgatanga Municipality to enhance quality academic work. The gesture, which was given to the most deprived Kindergarten (KG) schools in the Bolgatanga West B and Bolgatanga North Circuits, included 44 Hexagonal tables, 264 Children’s chairs, 11 Teacher’s tables and 11 teacher’s chairs. Each beneficiary school was further given teaching and learning materials such erasers, pencils, sharpeners, crayons and 50 copies of “My First Copy Book” among others. Speaking during the presentation, Mr Rex Asanga, the Executive Director of CESRUD explained that the donation was being funded by Amsterdam Bolgatanga Foundation, an NGO and said part of the funding was used to organize refresher courses for the KG teachers and about 42 teachers had been trained on modern classroom management to enhance effective teaching and learning. The Executive Director indicated that most of the schools in the area especially the basic schools were sitting on bare floor during lesson hours and the teachers had no tables and chairs and it affected effective academic work, adding that the intervention was therefore part measures to augment government’s efforts to provide quality education. He said government’s resources were limited and could not meet all the needs of every society, hence the brief ceremony to handover the items to the schools was aimed at initiating a conversation that would ignite self commitment from all individuals towards community development to boost sustainable national development. While he underscored the need for the beneficiary schools to purposefully use the items to improve upon performance in the area, Mr Asanga appealed to government through the Bolgatanga Municipal Assembly to put measure in place to improve upon the infrastructure of the schools especially the KGs in the area. Madam Paulina Patience Abayage, the Upper East Regional Minister, commended CESRUD for their efforts over the years in contributing to quality education in the Municipality and said it was gratifying to see individuals, groups and communities team up to develop or give back to society. The Regional Minister indicated that when societies waited for government to provide all their needs it would only worsen the poverty gap between the poor and the rich and added that it was time for individuals to emulate Mr Asanga and cultivate the spirit of self initiation to help develop society. She charged teachers particularly the beneficiary schools to work hard to turn the abysmal performance of the pupils in the area especially at the Basic Certificate Education Examination (BECE) level to give meaning to the gesture. Madam Elizabeth Asigri, the Bolgatanga Municipal Deputy Director of Education applauded CESRUD and its sponsors and said KG formed the foundation of every educational career and charged the schools to cultivate maintenance culture to keep the items in good shape always. CESRUD, registered in 1998 and operating at Sumbrungu in the Bolgatanga Municipal has over years contributed to improving basic education in the area including the collaboration with other Non Governmental Organizations such Friends of African Village Libraries (FAVL) to establish community libraries at Sumbrungu, Sherigu and Gowrie-Kunkua in the Bongo District. Aside partnering Biblionef and Lions Club International, two NGOs, to restock the libraries and create mini- libraries in all the basic schools in the two circuits to encourage reading, the humanitarian organization has empowered over 80 rural women groups with skills and knowledge to venture into income generating activities to improve upon their livelihoods.